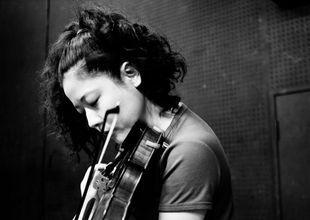 Hikari Soe studied classical violin at Kobe Women's University, and after graduating she decided to venture outside the classical realm, and take her first steps on the road to an ever expanding world of music. This road first took her to Boston, to study at Berklee college of music. There she was exposed to and studied music and techniques from a wide range of genres including Indian, Jazz, Middle Eastern, Blues, Rock, and Funk. She studied South Indian rhythmic solfege with Jamey Haddad and Bruno Raberg, Middle Eastern music theory and techniques with Craig Macrae, and Jazz improvisation with Rob Thomas, Eugene Friesen, and Mimi Robson. From the wide variety of genres that she studied at Berklee, the one that made the most impact her was the challenging and exotic sound of India classical music. The complex rhythms and raga system intrigued her and compelled her to go to the source of this soundscape. Soon after returning to Japan from her study in Boston she ventured to India to immerse herself in the country's classical music tradition. First, to Banaras to study North Indian Hindustani classical violin techniques with Sukhdev P.Mishra and Sohan Lal. Then, to Chennai to study South Indian Carnatic violin techniques under T.N.Krishnan. When she returned to Japan she studied raga musical theory with Yuko Matoba. Presently, Hikari is living her musical life through a myriad of performances, collaborating with many types of artists such as video artists, live sculptors, butoh dancers, contemporary dancers, belly dancers, and, of course, Indian dancers.